We live in the digital era, an interconnected world in which the internet is the undisputed king. That’s right! Internet is what makes everything possible for all of us. This digital era is highly influenced by technological revolution that we’ve been witnessing since decades. This digital era is what keeps us connected at all times. And we are so consumed by that urge to stay connected all the time that we often forget where it’s taking us. Today, everything is happening instantly, all because of technology and the internet. Most people see it as a great bonus, living in a digital society and staying connected with family and friends. Almost everything we do on a daily basis is only possible with the internet. And internet means connectivity and connectivity means staying online. When it comes to getting online, you have basically two options: a wireless connection via Wi-Fi and a network cable, commonly known as Ethernet. Wi-Fi is a technology that allows two devices to connect wirelessly using a wireless adaptor. It’s like a huge network of interconnected computers. Wi-Fi has made access to internet easy and convenient. But when it comes to pure speed, Ethernet is the undisputed industry and market standard. Let’s analyze the two options to better understand the difference between the two. Wi-Fi is a networking technology that allows mobile devices to connect to the internet wirelessly or to facilitate communication with one another wirelessly. In just a few years, wireless LANs have grown exponentially from high-priced networking solution to mainstream technology. Wireless LANs have definitely made it easy and convenient by removing the networking port from the equation and separating user connectivity from a direct physical location at the end of a cord. The best thing about going wireless is of course flexibility – no cable means no recabling and no recabling means easy moving and expansion. The idea of Wi-Fi technology was to create a free wireless infrastructure. The most obvious advantage of wireless networking is mobility. Technically, Ethernet is a standard communication protocol and the technology most commonly used in wired local area networks (LANs). The original 10 Mbps Ethernet standard was first published in 1980 by the DIX (DEC, Intel, Xerox) consortium and named as the DIX Ethernet standard. When the DIX standard was published, a new program led by IEEE was also going. Consequently, the coaxial variety of Ethernet ended up being standardized twice – first by the DIX consortium and the second time, by the Institute of Electrical and Electronics Engineers (IEEE). The two groups had different goals so IEEE implemented a few changes of their own to the original DIX standard. The Ethernet defines wiring and signaling standards for the OSI physical layer of the TCP/IP. 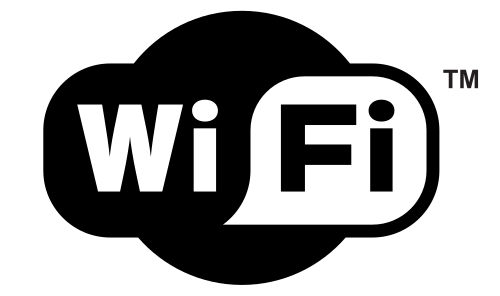 Wi-Fi is a networking technology that allows mobile devices to connect to the internet wirelessly or to facilitate communication with one another wirelessly. It’s a technology that uses radio waves to provide high-speed internet connection to the devices based on the IEEE 802.11 standards. Ethernet, on the other hand, is a standard communication protocol and the technology most commonly used in wired local area networks (LANs). It simply refers to the physical cable or the internet cable over which the data travels. One of the key differences between the two and an obvious advantage of Wi-Fi over Ethernet is mobility. Wi-Fi is undoubtedly the most popular type of internet connection today which allows users to access data while they are in motion which can lead to large productivity gains. It’s a perfect fit for the people who are constantly on the move and who would like to access the internet from multiple locations at once. Wi-Fi means no wires and no wires mean no ports. Ethernet is basically cables which mean lots of cabling so no mobility. The most obvious advantage of wireless networking is flexibility. Wireless connection means no cables which mean no recabling. It’s also the most easy and convenient because it doesn’t require any cabling for installation. Wireless networks allow you to quickly create small group networks for a quick official meeting, and Wi-Fi makes moving between spaces and cubicles a breeze. Ethernet, on the other hand, is not always an option when it comes to hassle-free moving and expansion and with devices like smartphones, smart watches, tablets, and laptops, Ethernet is out of the question. Although Wi-Fi is the most logical option when it comes to mobility, flexibility, and ease of deployment, there are still areas where Ethernet excels such as speed and efficiency. 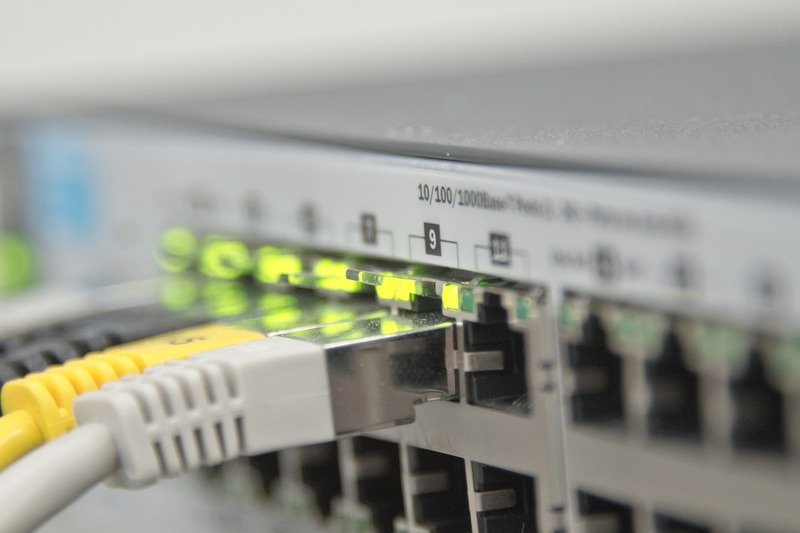 While Ethernet involves a physical connection rather than being wireless, it offers faster data transfer speeds than it wireless counterpart because wired connection is more consistent. Speed is the biggest selling point for the Ethernet and is definitely more efficient and reliable than Wi-Fi. Plus Data flow need not to be encrypted over Ethernet like Wi-Fi does, plus latency is much lower when using Ethernet. Ethernet primarily refers to a physical cable over which the data travels whereas Wi-Fi refers to a network of interconnected devices that are connected wirelessly. Ethernet is basically cables, a link between your computer and the internet. It’s a wired connection that links your computer directly through a USB cable or an Ethernet cable. Wi-Fi is more like a networking technology that allows mobile devices to connect to the internet wirelessly. The most obvious advantages of Wi-Fi over Ethernet is flexibility and mobility, but Ethernet offers more data transfer speeds than Wi-Fi. Sagar Khillar. "Difference Between Wi-Fi and Ethernet." DifferenceBetween.net. 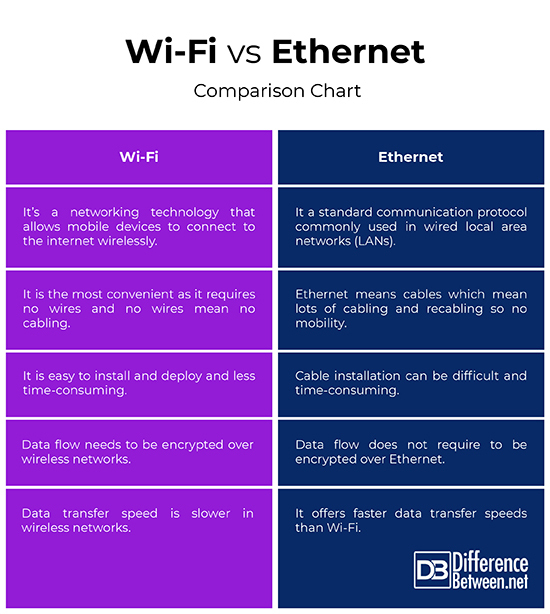 November 5, 2018 < http://www.differencebetween.net/technology/difference-between-wi-fi-and-ethernet/ >.